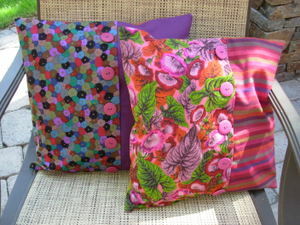 My Button Back Pillow Tutorial is on board at the Sew, Mama, Sew! blog for Handmade Holidays. There are also some other really cute projects, include a bunny pillow you have to see. I managed to have a whole weekend of doing whatever crafty thing I wanted last weekend and it was wonderful! The weather even cooperated by being rainy and dreary, just what you need for staying inside and crafting! I got down to making some of Tonya's free pieced letters. At first I followed her examples, but once I got into it it went really quickly and was so much fun! You have to give these a try. Chloe and I are planning a quilt using Merry Christmas in several languages for the Lazy Gal Winter Class. Even if you don't join the class, it's a great place to stop by for inspiration. 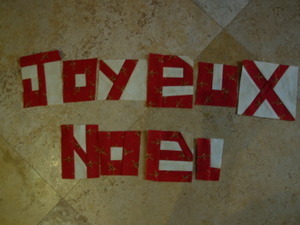 When I fill in the background on the Joyeux Noel, I'll add the two dots over the e. Meanwhile, the first two letters of each of the other phrases are below. Can you guess what they are? **See below after you've made your guesses. This quilt is coming into focus now in my mind, so more on that later. The words will go around the border, so I have to plan the interior now. 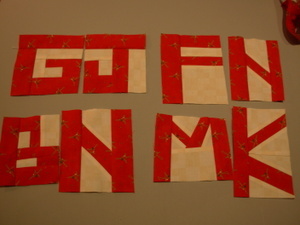 I had a flash of inspiration on Monday night and had to put these letters together for a mini quilt for Ryan. I just loved this Santa drawing he did and when I saw a sign that said "Better Not Pout", I thought that was a perfect idea for him. I'll transfer Santa to the quilt with some applique and embroidery and I'll do it on a circle of that ivory background color so he shows up. I plan to add a bit more background fabric around the letters and applique them down as well, so as to preserve the plaid pattern on the red fabric. I'm also going to see if I can get him to draw a simple tree to applique on the left side. 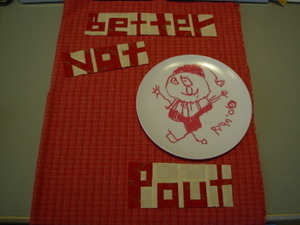 I think using children's drawings along with these free pieced letters is a natural combination. **God Jul, Feliz Navidad, Bon Natale, Mele Kalikimaka.